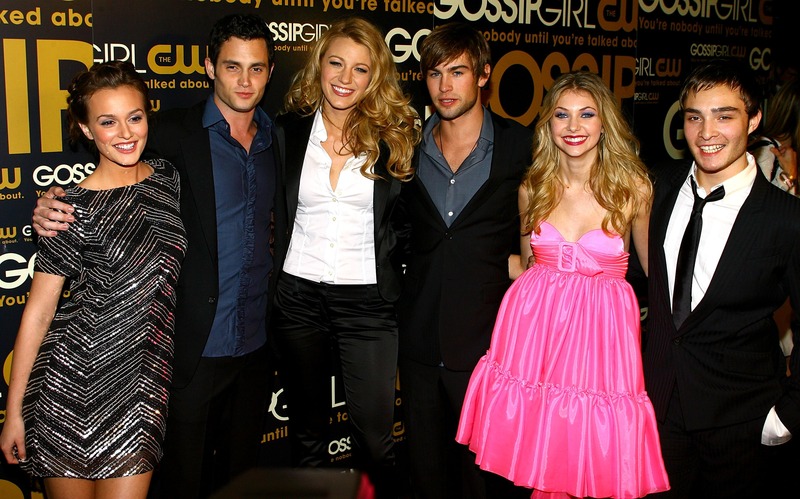 The 'Gossip Girl' Cast Had A Mini Reunion At The Oscars, But How Would Their Characters Act If They Attended The Show? Gossip Girl fans, brace yourselves. If you haven't already heard or seen, part of the Gossip Girl cast reunited at the Oscars and it was pretty much the best thing ever. Not only did it bring back memories from The CW show that made us all want to live in New York City, but (spoiler alert) it also made me question all over again how Dan Humphrey could be Gossip Girl. Moving on. As you can see in the photos below, Chace Crawford (Nate Archibald), Kelly Rutherford (Lily van der Woodsen), Michelle Trachtenberg (Georgina Sparks), and Jessica Szohr (Vanessa Abrams) gathered for a reunion photo making every Gossip Girl fan squeal with delight. I know it's hard to believe that these actors get along, but you also must remember that they only played characters who despised one another from time to time, all while trying to ruin each other's lives on TV. Makes you miss the show, right? Well, these two photos (oh how I wish there were more), got me thinking. How would these particular Gossip Girl characters act if they ever attended the Academy Awards? There would probably be some lies, secrets, blackmail, backstabbing, and, of course, seduction. Overall, Nate, Lily, Georgina, and Vanessa would make the Oscars even more exciting. With that said, here is how each character might act if they attended the biggest night in Hollywood. Nate would play it cool, but he'd be secretly screaming with excitement. He'd be like, "I'm just going to stand here and sip my cocktail like this is no big deal." Then, he'd spot a beautiful woman across the room and try to pursue her. We all know how much Nate likes older women, so he may or may not get Meryl Streep to have an affair with him. He might look innocent, but he's very good at seduction. Oh, Georgina. She would be all, "I've arrived! Pay attention to me!" She'd make her away around the room seeing who she could blackmail first. Maybe even find someone she could trick into believing they got her pregnant, like Bradley Cooper. Then, after all that fun wore off, she'd get bored and want to leave. Vanessa would be super pumped to showcase her unique dress. We all remember how she walked to the beat of her own drum. As a filmmaker, she would probably try to meet some of the top directors and producers, like Oscar-winner Alejandro González Iñárritu. They would probably bond, but then someone would interfere, say Georgina, and Vanessa would feel left out and probably make that sad face she's famous for. As for Lily, she'd act like this is nothing new because she attends events like this all the time. She'd walk around all gracefully, smiling, and laughing with all the big stars. Yes, Rufus is in tow. Speaking of Rufus, forget about him ending up with Lisa Loeb (WTF?!). In my world, Rufus and Lily are together. Then, bam, Lily sees an ex-lover (possibly the dashing Idris Elba), who would make things super awkward, especially if Rufus is there. Drama, drama, drama!